We’ve been through and stayed in Salt Lake City many times. We’ve skirted the Great Salt Lake. But we’ve never spent any time camping around the lake, so we headed out to Antelope Island State Park. 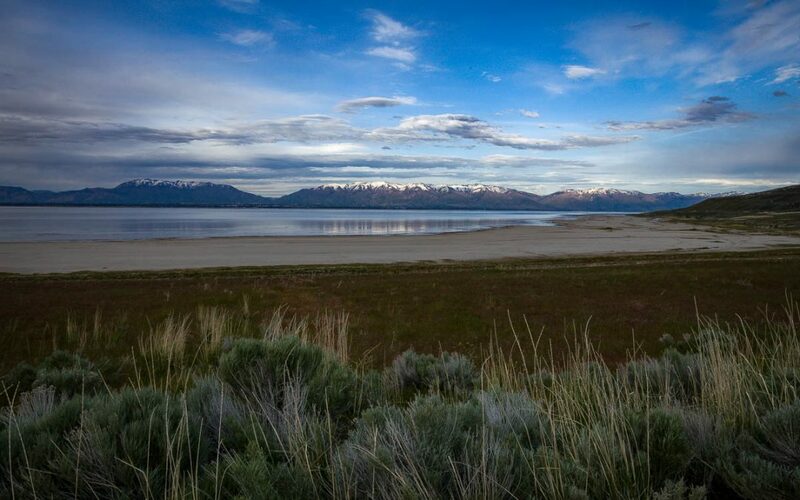 By the time we arrived at Antelope Island, it was getting close to dinner time and sunset. As we pulled up to the entry to the park, we noticed an electronic sign flashing to the right side of the entrance. It said BUGS, BUGS, BUGS. I thought it sounded like it might be an interesting display to view at the visitor center, until the red blinking lights of the sign continued on to say BITING GNATS. Then I noticed the sign by the ranger window that said THE BUGS ARE BAD. Jim pulled out money to pay for the fee and the ranger asked us if we really wanted to stay there, pointing to the sign. Well, I’m phobic about blood sucking bugs. But on we went to our designated campsite #13. By the time we got there, the windshield was covered with Biting Gnat bodies. They looked suspiciously like large mosquitoes to me. They were swarming outside. I felt that that quantity and size of Biting Gnat would get the best of my beloved BUZZ OFF hat, which repels mosquitoes. I opted to stay nice and safe in the car, while Jim proceeded to ignore the bugs and haul the camera equipment out of the car. We went for a drive, Jim shot some photos and we headed back to #13. At this point it was dark, and I quickly slipped from the car into the Pod (tear drop trailer). Once I eradicated some stray Biting Gnats, I was able to settle down to a peaceful sleep (with Buzz Off hat on), despite the raging wind that had kicked up outside. But it was all worth it, as you can see above. That is just one of the spectacular photographs that Jim took last night. Hi, I have been getting your very interesting Route89 newsletters for a year now, and am now planning to visit the USA , we live in Sydney Australia and will be flying into LA , late August. We want to visit the National parks near Vegas, then go North to Yellowstone . Can we do all that in 3 weeks? It’s such a BIG country ! We will be driving of course. Any advice will be gratefully accepted.